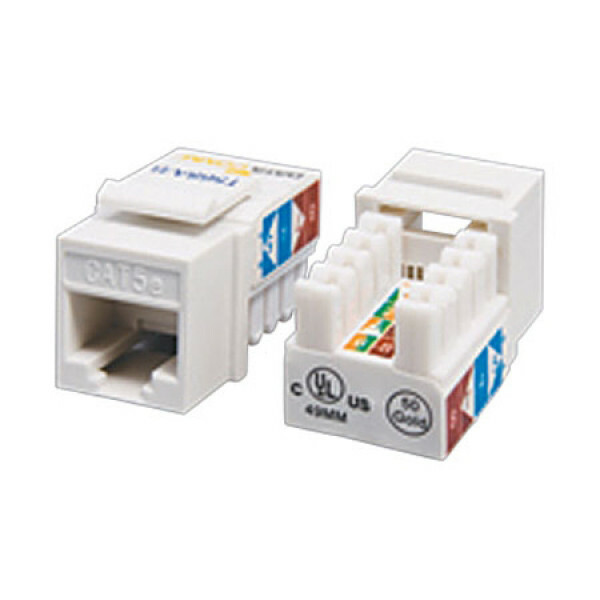 Cat5e Tool Type RJ45 Keystone Jack used for unloaded keystone wallplate or patch panel. Specifications: Type: Panel-type Unshielded RJ-45 (8P8C). Termination: 110/KRONE IDC vertical punchdown for 22-26 AWG solid wires. Supports: Dual T568A & T568B wiring compatible with Category 5 enhanced requirement. Use: Any unloaded keystone wallplate or patch panel. Certifications: UL listed; Complies with FCC Part 68.